Last year was a great success so SPEAR are back this year and the Kingston Round Table have very kindly included SPEAR to benefit from the Christmas Carol Wagon collection this year on Thursday 6th December, bringing festive cheer to the residents of Kingston and Surbiton raising money for local homeless. This promises to be a fun event and we need volunteers to sing along and help collect donations. If you think this sounds like it could be part of your Christmas celebrations please get in touch. If you can’t help just come along and bring your friends and family and enjoy. The evening routes all start in Kingston around 6:00pm. Keeping with tradition, each night has a different route. 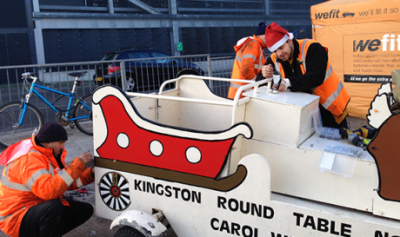 Have a look at https://kingstonroundtable.org/charity/carol-wagon/ for more info. Children under 12 are unable to attend due to the physical nature of the event. The event means moving at a quick pace for 1.5-2 hours so please don’t join in if you think that this will be too strenuous.